One of my readers has suggested that I write about teaching lessons for girls of all different backgrounds. I was intrigued by this idea – I wondered what she meant. Like, less-active girls? Part-member families?….I’ve thought about it a lot. If your ward is like mine, you’ve got a wide range of backgrounds in your young women organization. When you boil it down, I feel that no matter what the background or circumstance, all of the young women need the same thing. They need a testimony of Jesus Christ and his gospel. This is what prompts them to keep the standards, repent, study the scriptures, pray, want to attend lessons and activities, be missionaries, etc. I feel that this is the root of a lot of the struggles our young women are facing, regardless of their background and family situation. If they don’t have a testimony of Jesus Christ and his restored Church, why would they want to do any of the things we’re trying to teach them to do? You’ll probably recognize most of these situations in your own ward. Of course, these situations I’ve listed might not apply to everyone and many girls will fall under multiple categories. Its usually not helpful to label people, because we are all complex individuals, but it is important to be aware of the situations our young women are dealing with so that we can be of the most help to them. We may place a lot of focus on helping the girls who need the extra support or are struggling, but even the girls who already have a testimony (or the beginnings of one) will need to be strengthened to keep their testimony going through all they have to face in their teenage lives. Many times the “goody-goody” is the outcast, even among her fellow youth in the church. Just like adults, every single one of the girls I’ve worked with could use some testimony-strengthening. Specifically their testimony of Christ- who is the center of everything we believe and do. No matter what the assigned topic, Jesus Christ is the topic. Prepare/teach a lesson as if it were the last one they are going to hear (because sometimes it is). I am a convert to the church (the only member on my side of the family) and a returned missionary. So I think (and hope) that I’m pretty missionary minded. When I prepare a talk or a lesson, I recognize that there will probably be at least one investigator or non-member visitor in the congregation that day. I plan for that. I try to think about what I would say if one of my own family members were there. Would I “phone it in” with my preparations and just ‘wing it’ or read a Conference talk word for word if I knew that they would be there? I would try harder to have the spirit and teach from the heart, and bear an honest testimony thats for sure. But what do we bear testimony of? And what if our topic is something potentially awkward to a visitor or less-active member, like tithing? Even if I am assigned the topic “Tithing,” I still consider Jesus Christ to be the primary focus of that talk….Why do we pay tithing? (to show obedience to Christ, to become more like Christ, to teach us sacrifice like he has sacrificed for us, etc). You don’t have to talk about Christ the entire time, but if Christ is the head of our Church and the center of our lives, should be at the core of all we do and teach. I use this exact same concept for young women Sunday class lessons. Are we teaching, preaching, and testifying of Christ, every chance we get? Do we talk about him every single Sunday? If we want the young women to understand that they can look to him, we need to make his name and teachings a presence in our lessons. The girls need this – no matter what background or situation they come from. The investigator, the disgruntled young woman, the girl who is only sitting there because her parents are “making” her, the Hermoine Granger – every one of them. Some girls (many) are not getting this at home. Even if they are, its not something you can reinforce too much. In our ward, we don’t have advisors, so the presidency members teach the Sunday lessons. I’ve had experienced some situations when I’m teaching a lesson and I know that it is likely to be one of the last lessons one of the girls will hear (or maybe even the last). As the girls grow older, they want to make their own decisions and create their own identity. They start to question why they have to keep all of these ‘rules’ and begin to realize that its getting harder and harder for their parents to force them to come to church. I think to myself- what can I say, what can I do to help this girl? What will she remember about this lesson? Will she say that she’s not accountable because she was never taught the correct principles? Will she say that she didn’t know whether I had a testimony or not? Even if she doesn’t have one – I need her to know that I DO. Several years ago we had a teenage girl join the church. 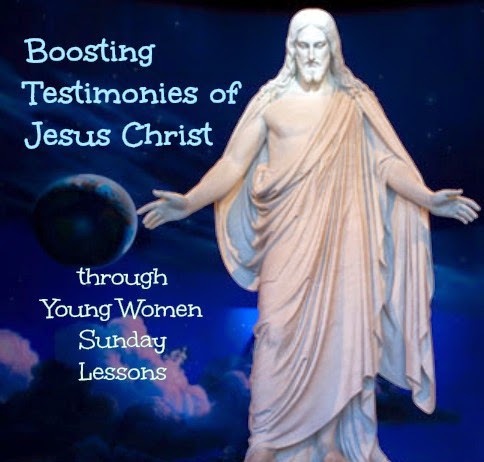 One Sunday, her mother (a Catholic) unexpectedly attended church with her and she was invited to YW class. I was teaching all of the girls that particular day, and the lesson was about a very sensitive topic that I knew was a point of concern for her. I only had 1 hour notice that the mother would be attending class with us. I was panicking a little. Not because I didn’t know what to say, but because I had already geared the lesson toward active girls who are familiar with the concept, so I needed to make some changes to my plan. I tried to think of how to explain the concepts to everyone – but especially to the mother of this recent convert. I tried to explain the doctrine and my feelings about them. I bore my testimony. I tried to say everything I would want someone to say if my own parents had been present. This is how we should approach teaching the young women every time…. not just special occasions or with special visitors – every time. Because they need it and because it might be the last time they bother to show up. I don’t mean to sound negative, but its not uncommon for young women who used to be active to suddenly refuse to participate in young women. Their reasons may vary from “its dumb” to “I just don’t believe in the doctrine.” As a leader who cares for and stressed out over how to help the young women in our ward, it hurts. I feel that focusing on Christ and bearing our honest testimony are two of the most important things we can do to help these girls. I am totally on board with the “Come Follow Me” youth curriculum, so please don’t misunderstand. Our emphasis has gone from preparing an old-fashioned “speech” lesson to trying to create an interactive experience for the youth to develop their own testimony through discussion, experiencing teaching, etc. Although I try very hard to follow that model and it has been very successful, I always try to keep the focus on Christ and still always try to end with my heartfelt testimony. I never want anyone to leave the class without knowing that I know.